More often than not, films make one realise that there is so little we know about a certain group of people and their practices even though we live in such close proximity to them. The people I am speaking about in this case are the Roma, a misunderstood and ostracised people that continues to remain an enigma for much of western society. In the documentary Ťažká duša (Heavy Heart), directed by Marek Šulík, the viewer has the rare chance to get to know the Roma and their unique traditions more intimately. In a community where family, culture and music play a pivotal role in daily life, the documentary sheds light on the world of three young people within the Roma community, who are manoeuvring their way through omnipresent questions about modernity, change, traditions and dreams. 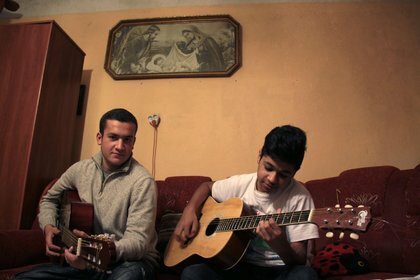 The film poetically traces the transfer of original ancient Roma songs from the older generation to the younger ones. The film arose as a part of an ethno-musicological research of Roma songs under a larger ongoing project called Silalo paňori. The director has been has been part of the research for over 10 years, working on several video recordings, documenting Roma music from modern pop to traditional music. Marek Šulík graduated from the Academy of the Music and Dramatic Arts (VSMU) in 1997, specializing in documentary film. 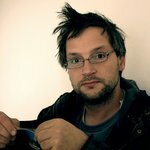 He is one of Slovakia’s most prominent documentary filmmakers and has predominantly worked on films addressing social topics and issues. During our conversation, Šulík mentioned that an unfortunate correlation was found between the quality of ancient Roma music and the poverty faced by the Romani people. While carrying out their research they found the most well-preserved Roma music in the east of Slovakia, where the majority of the Roma population is not integrated into Slovak culture or a modern lifestyle. WOMEX Film had the opportunity to chat with the director, Marek Šulík, about the film and his work within the Roma community. Sana Rizvi You have two other projects within the Roma community, Cigarettes & Song, Bells of Happiness and now Heavy Heart - is there a personal fascination with the Roma people and their music? Marek Šulík When I was in school, I watched a popular ten-part TV series on Roma culture directed by Martin Slivka who later was also a professor of mine in documentary school. So there was definitely an impact and interest from a very young age. For me, being part of the research project Silalo paňori was much more than just discovering Roma music, but discovering another culture, another style of living, and another way of living. SR Could you tell us about the Silalo paňori project and how you came to be a part of it? MS Šilalo paňori (Cold Water) is an ethnomusicologist research of ancient Roma songs that was carried out in the Slovak Academy of Sciences by Jana Belišová. Outputs of the research were: documentary films, 25 documentation videos, social travelogues and a collection of songs with a scholarly article. The name “Cold Water” came to be as a symbol of crossing something difficult in one’s life. Cold water is a symbol of catharsis and purification within the Roma. Over 10 years ago, I was asked by Jana Belišová to enrich the research through video recordings. It has been a very nice experience and it resulted in a DVD with music, as well as videos with lyrics one could sing along to - just like karaoke! And from then on we continued our collaboration on the research leading to several other documentary films including Cigarettes & Song, Bells of Happiness and most recently Ťažká duša. SR The film starts with an intimate, strong and emotional scene, on one side connected to the memories of certain songs and on the other side forgetting the songs; a theme that has strung the film together. Could you talk a bit more of the way the Roma feel about their music? MS Home singing of traditional songs has a steady place in the Slovak Roma community till today. Songs are usually connected with memories and experiences of their singers. Roma songs of lament, which are connected to personal stories, serve as a cleansing and a healing balm for the pain and suffering of the community and thus songs and music play a very important part of their tradition and culture. 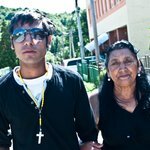 SR Was it intentional to portray the dilemma faced by the Roma youth of what they want to do and the life they want to live and what do their family and culture expect of them in the film? 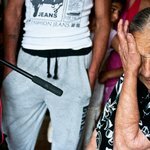 MS Yes, it was intentional in the sense that we were looking to document the relationship between Roma parents and their children through which we could gather evidence on whether Roma music was alive or dying in today’s society. Documenting family relationships was the best way to gather evidence on how the transfer of musical experience from the older generations to the younger ones takes place. For example in the film Ťažká duša we have the story of Erik who is living in a very destructive community and the father wants to protect him from these dangers through music. Erik wants to live a different way of life where one can have all the comforts of living and this was much more important for him than the songs his father is trying to teach him. Also, for me, the most important point to acknowledge and document was that we are probably witnessing the last authentic musical generation of this community and everything is connected to the circumstances of their life in regards to whether they could continue with their traditions or not. SR What do hope WOMEX viewers will take away from this film? MS I hope the viewers at WOMEX will experience an intimate insight into the Roma culture, which is normally closed for outsiders. That was interesting also for me. We at WOMEX Film certainly hope that the audience will take this unique opportunity to watch Ťažká duša, a heartfelt film, which, through the lens of music, gives one a better understanding of the omnipresent struggles between the old and the new in the Roma community. A community whose traditions and cultures need to not only be documented and shared, but more importantly valued and preserved. Ťažká duša (Heavy Heart) is being shown as part of WOMEX 18 Film Screenings on October 26th at 12pm in Film Room 2, INFECAR. We are equally thrilled that Jana Belišová, an ethnologist researching Roma music for the past twenty years and producer of the film will present the film to the WOMEX community.